This lively little book comes with an endorsement from Gloria Steinem who most memorably addressed this issue in the October 1978 issue of Ms. magazine with her essay “If Men Could Menstruate” (“Young boys would talk about it as the envied beginning of manhood. Gifts, religious ceremonies, family dinners, and stag parties would mark the day.” “Men would brag about how long and how much.” “Sanitary supplies would be federally funded and free.” ). This wonderful article needs to be revisited in all its glory as it could be argued that Ms. magazine was only reaching the already or ready-to-be converted. 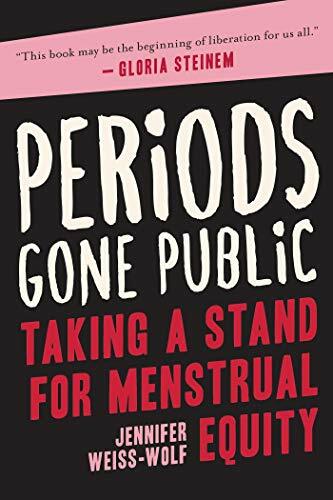 Jennifer Weiss-Wolf aims to take period or menstrual equity to a wider audience by looking systematically at the ways menstruation affects the public and private lives of girls and women, and, yes, transmen. She reviews the activism and arguments directed at the removal of the tampon tax even where it is classified as a medical not a beauty product, and the costs (minor) and benefits (major) of providing free supplies in washrooms in schools, offices, department stores, etc. She addresses particularly the need to find ways of addressing the normal human needs of the homeless and poor, with particular attention to the plight of female prisoners whose supplies are often rationed to an unfeasible minimum. In doing this she presents irrefutable health and economic arguments as well as some unforgettable examples of raucous activism directed at America’s finest, among whom we include Trump and Pence. Most of her material is drawn from the U.S. and the U.K., and a very interesting early chapter on innovative practical work in India and Africa gets drowned out. We read much later and in passing that Kenya was the first country to eliminate the sales tax on menstrual products in 2004 as well as the import duty on foreign sanitary wear, and by law distributes free sanitary pads in schools. It would have been helpful to present briefly and early some of the theoretical frameworks for treating female reproductive powers as taboo. To present cogent counter arguments you need to understand the arguments especially if the rationale for the attitude and practice is now totally anachronistic. The menstrual or period equity movement has not quite found yet found its winning terminology. The term “equity” makes sense as applied to all girls and women and trans men but it’s hard to make a precise equivalence across the board, and feminists themselves have often shied away from dealing with manifestations of “natural” difference in their arguments for equality to avoid the appearance of special pleading. Overall, a gripping and entertaining read that would have benefited from tighter editing.